From the vantage point of his fisherman’s cottage by the sea, Justin O’Brien delighted in painting the changing effects of light and colour on the simplest of objects in his Grecian home. Still Life with Angel Fresco, 1972 shimmers with heat and expectant stillness. The soft velvety finish of O’Brien’s oil paint carefully translates the surface textures of each object in his field of vision, from the delicate petals of chrysanthemums in a bouquet, to the skins of green grapes, the worn and cracked leather of sandals in the doorway, and the crumbling plastered surface of the fresco. Every object presented here is imbued with timeless simplicity, of ancient modes of interaction with the landscape, unchanged for millennia – yet interpreted by O’Brien in a blaze of modernist colour and flat rendition of form. 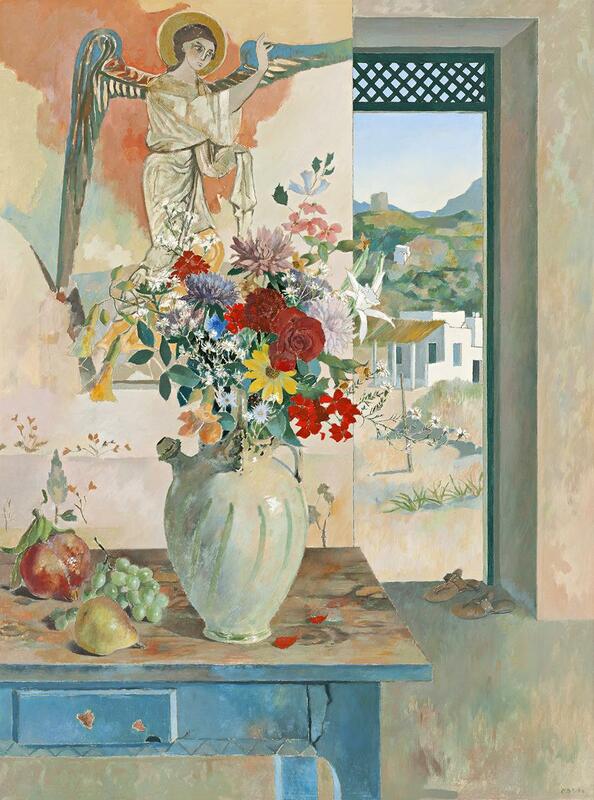 Still Life with Angel Fresco, purchased directly by James Fairfax from O’Brien’s exhibition at Sydney’s Macquarie Galleries in 1972, was exhibited along with Still Life Against a Landscape – a smaller work, a variation on the same theme. Still Life with Angel Fresco depicts the same view of the wooden table, identical down to the precise recreation of the arrangement of fruit and flowers, but placed against an open doorway and frescoed wall instead of a window. Here, the eponymous angel gestures towards an enticing sliver of landscape visible through the doorway, blessing the view with a raised hand. The rocky, arid landscape beyond was the artist’s own paradis terrestre, a place where a simple existence could reveal hidden spiritual forces. 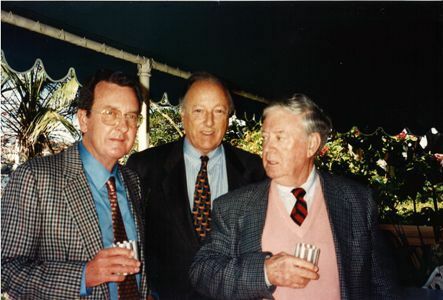 In 1967, Justin O’Brien resigned from his teaching position at Cranbrook School and left Sydney, returning to the Greek island of Skyros where he had holidayed some years previously. A decade later, he explained to Christine France, who was writing a monograph on his work, that despite much criticism from his peers he found his work to be especially stimulated by the peaceful beauty of the Aegean.1 He wrote to his friend Martin Sharp in London, expressing a desire to ‘get away from this rat race and bury my Irish mug in some Aegean sand. If this is living I’d rather be dead!’.2 In the tense socio-political context of the late 1960s, O’Brien was not alone in seeking an unspoiled natural environment, away from the threat of an impending war in Vietnam, and the claustrophobia of exponential urban sprawl and capitalist consumption. 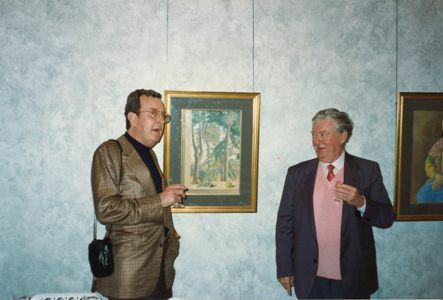 Justin O’Brien was a contemporary of James Fairfax, an artist-friend who benefited from his direct patronage and with whom the collector socialised. Fairfax purchased Still Life with Angel Fresco from its first exhibition at Macquarie Galleries, even before it had opened to the public, having enjoyed exclusive previews of exhibitions there from his early teenage years.